I spent the first part of my day taking my mom to the dermatologist and then out to lunch. By the time I got home, I was feeling a bit frazzled that I was so far behind in my day. However, when I opened up my computer the first thing I saw was this sweet photo of my two granddaughters sharing some quiet time at home for the first time. I felt an immediate calmness come over me. After all, what could be more important than this? So I thought instead of my usual Monday post, I would share some random photos of spaces I like. I hope the rest of your day and week is filled with peace and serenity. Morning Laura! well I thought it was morning cuz I'm behind on my work today, too. oh well.... seeing that darling snap of your two precious granddaughters is so sweet of you to share. thank you...thank you. Oh, the look on the big sister's face is just lovely...makes my eyes tear, such a precious photo. That little one is blessed. what a wonderful picture! helps put our priorities right back where they belong, thanks for sharing..
That is so sweet. Perspective. It is so important to put things into the order of importance. Those sweeties surely did it for you today. Aww! What a precious photo of the granddaughters together! What a sweet sweet photo! Peace and serenity will have to wait a little while. We are having our house painted this week and they started today. We had workers everywhere! 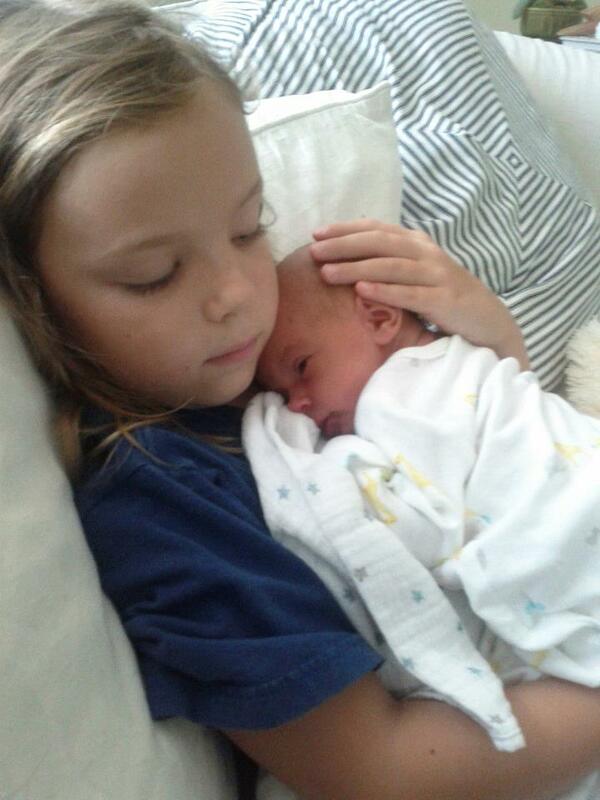 The pic of your little g'daughter holding her sister is so adorable!! Adorable photo of the granddaughters! Beautiful pictures thank you for sharing. Your grandaughters are beautiful. Just sitting and laying there peacfully. What a beautiful photo of your granddaughters! So sweet! I love seeing this beautiful photo of two beautiful girls sharing a beautiful moment! Joy! That photo is a gem. Priceless and so beautiful. Congratulations on your new granddaughter. She is so beautiful. I;m glad the picture of her sent you off on a wave of joy. I think all of your rooms and spaces you showed are just so lovely. They just pull me right in to the peace. Thanks so much.